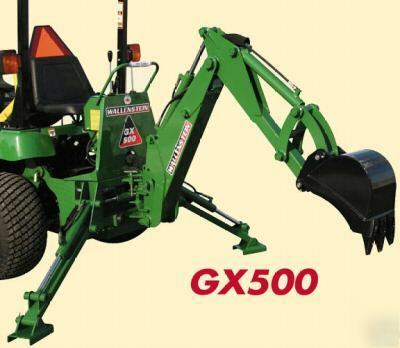 Brand New Wallenstein Model GX500 3-Point Mounted Backhoe. This is a Great Backhoe for 15-25 HP Tractors. * Comes Complete & Ready to install! * Price includes 12" wide bucket. * Price also includes Hydraulic Hoses & Tips. * This Listing is for a Black Backhoe. * Transport Weight is 525 lbs. * Digging Depth (2' flat bottom) is 5 1/2 ft.
* Overall Operating height is 85". * Reach from Swing Post is 90". * Stabilizer Spread Operating Position is 78". * Hydraulic Volume Requirements is 4 to 7 gpm. * Recommended Tractor HP is 15 to 25 HP. * Bucket Sizes available are 9", 12", 15". * 3 Point Hitch is rated Category 1. * Main Boom Cylinder Diameter is 2". * All other Cylinder Diameters are 2" & 1-3/4".